After a long winter, it’s finally time to ring in spring, and if you observe Easter, you’ve got twice the cause to celebrate. But some Easter traditions can endanger your furry friend, so here are 5 things to look out for. 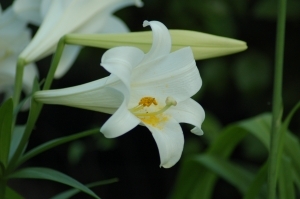 Easter lilies — as well as daffodils and other true lilies — are everywhere this time of year, but to cats, they’re so toxic, they could be fatal. Whether your kitty nibbles the plant or just comes in contact with the pollen, he’s in danger. We suggest skipping these flowers altogether, and if your cat ingests them, go straight to the ER. Candy is a big no-no, and not just chocolate, which is very poisonous for dogs — a sugar rush is bad for any pet. Sugar-free candy is no safer: xylitol (an artificial sweetener) can be fatally toxic. 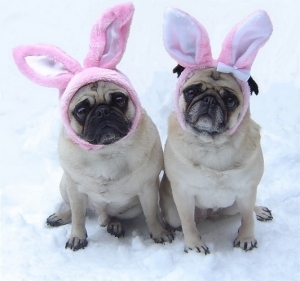 Don’t let your pets join the Easter egg hunt! Whether you’re using real eggs or plastic ones, they’re bad news. Eggshell can cut your pet, and the plastic ones are full of (what else?) candy. If you plan to hide Easter eggs, take note of where each one is hidden. Easter grass — the colorful, fake grass that fills many baskets — is a tempting toy for mischievous pets, and it can get caught or tangled in their intestinal tracts. Look for paper “grass” as a safe alternative. Rich foods like ham (plus whatever you gave up for Lent) are in abundance on Easter Sunday. Look away for a moment and your pet could sneak a bite, which can give them indigestion and put them at risk for pancreatitis. No need to skip out on the feast, but keep a watchful eye!